Today was such a beautiful day. Beautiful Sundays always make me want to set out an amazing brunch. Brunch is definitely one of my favorite meals. I love the laziness of brunch; I love to linger over the delicious foods, reading the paper, and enjoying life. Brunch to me means relaxation. My absolute favorite brunch food has always been eggs benedict, and my vegan version, which has been a work-in-progress for some time now, is so great that I will post it soon. Today, however, I made another of my favorites. 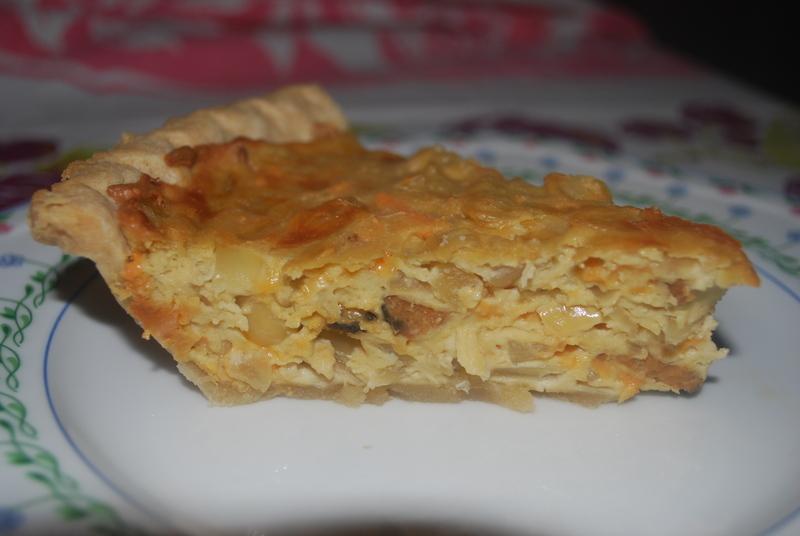 Quiche Lorraine. Quiche Lorraine? How can that be vegan, you may be asking. 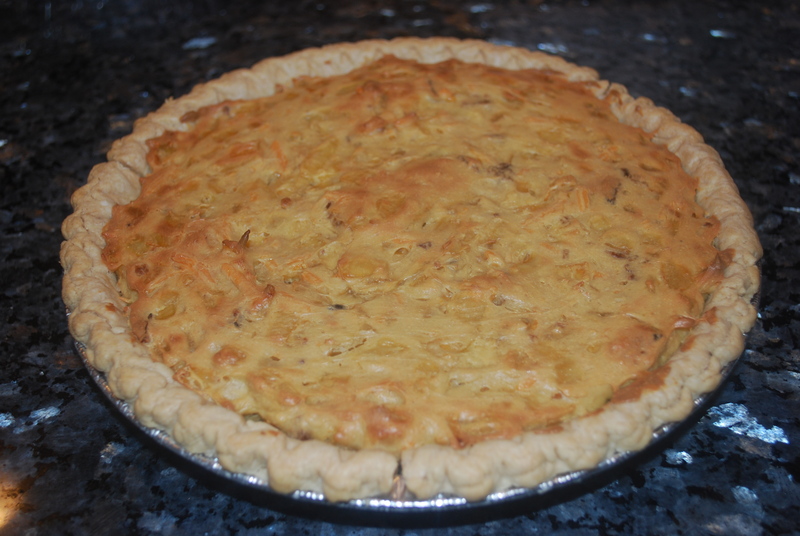 After all, not only is quiche usually made with eggs and cream, but Quiche Lorraine also has bacon and cheese. 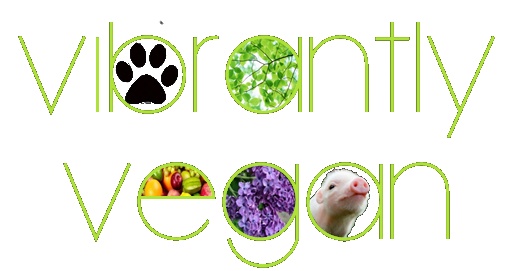 Pretty hard to veganize, right? Wrong!! This vegan version is savory and delicious, as well as nutritious, and is the perfect way to enjoy a lazy Sunday brunch. 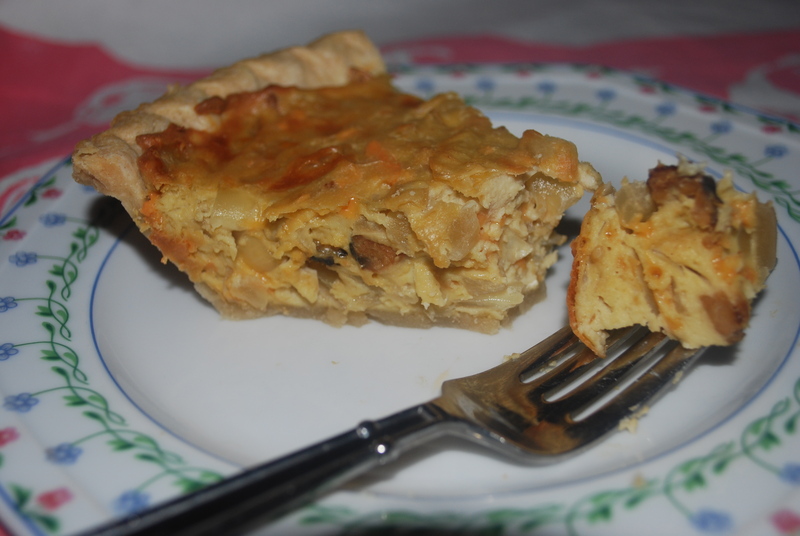 A green salad, a fruit salad, and this quiche, and my Sunday afternoon is complete! For the frozen pie crust, I prefer wholly wholesome, found in specialty stores, but many major supermarket chains carry vegan ones, such as shoprite – just check the ingredients and make sure there is no butter or eggs. You will be surprised how many frozen pie crusts contain neither! Press the tofu in a tofu press, or place it on a plate with another plate on top and some heavy objects, such as books or heavy pots, on top of that. Leave for about 20 minutes and the liquid will be released. In the meantime, lightly grease a small pan and brown the fakin bacon on both sides over medium high heat. Remove from pan and cut into small pieces. Set aside. 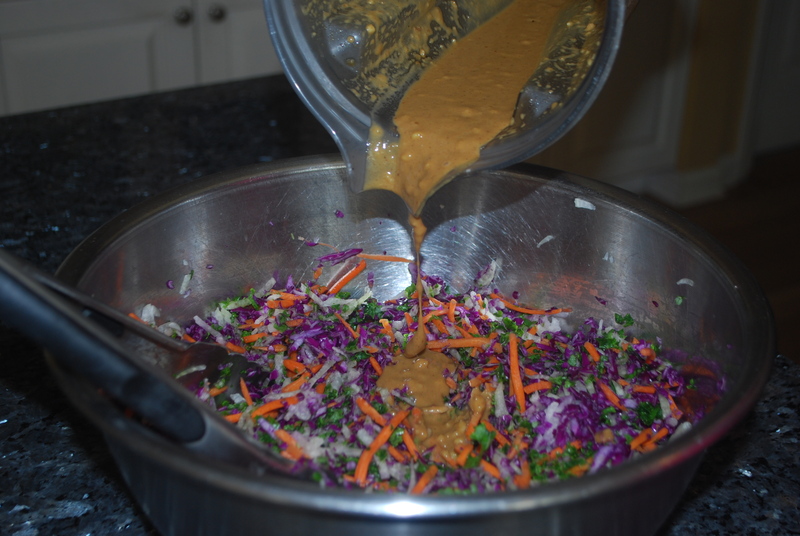 Place the cashews, tofu and nutritional yeast in a blender and blend until smooth and creamy. Pour into a large bowl and set aside. Add olive oil to a large pan over medium high heat. Saute onion until translucent, about 5 minutes. Add the bouillon, salt and onion powder to the onion and mix to combine well. Add the onion mix to the large bowl with the tofu mix. Add the bacon and the cheese and combine well. Bake 10 minutes, then lower oven to 375 and bake 30 minutes more. I love jicama, also known as the jicama Mexican yam, or the Mexican turnip. 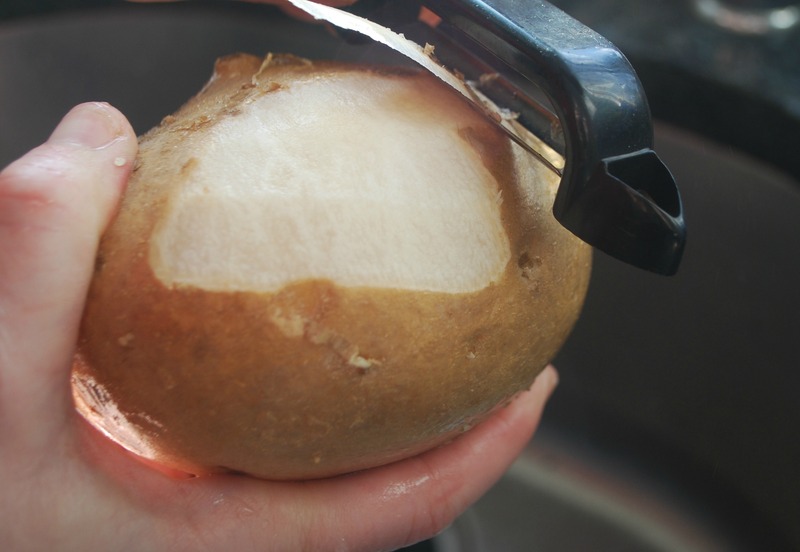 It has a subtle taste that is reminiscent of both an apple and a potato. It is so crispy and refreshing and loaded with vitamin C. My only issue with jicama is that it does not have an amazing color, but that is no problem. 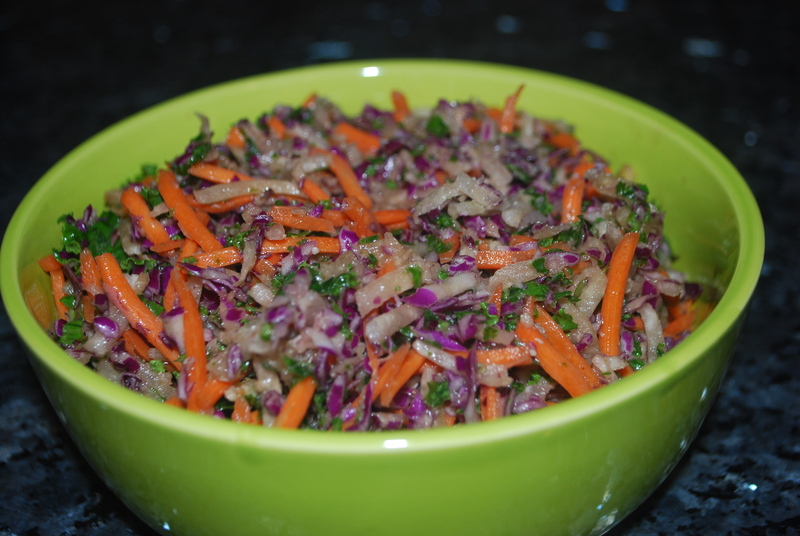 I just paired it with orange, purple and green veggies for a delicious salad that is pleasing to the eye and full of nutrition. 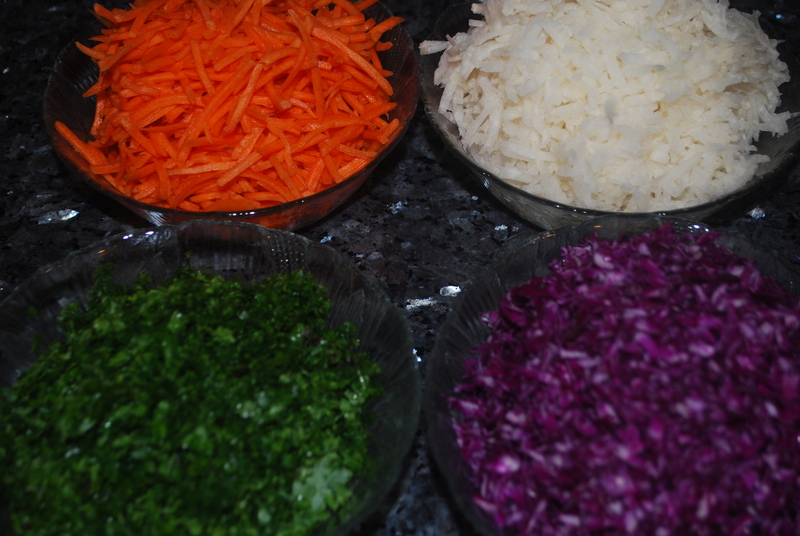 I love knowing that I am eating the colors of the rainbow, with some jicama thrown in! 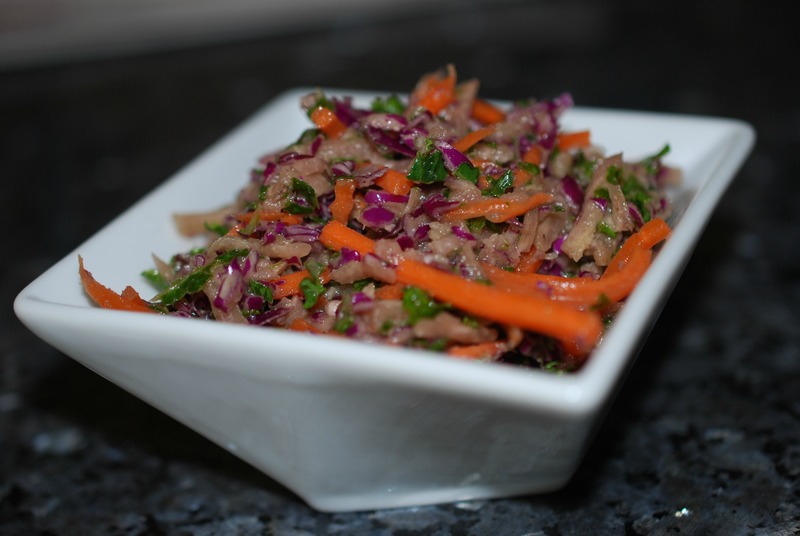 Just peel the jicama and shred for this salad. You can even just bite into it like an apple! I use my food processor with a shredding blade, but if you don’t have one, you can certainly shred the carrots, cabbage and jicama with a hand grater. The kale, however, you will have to finely chop. 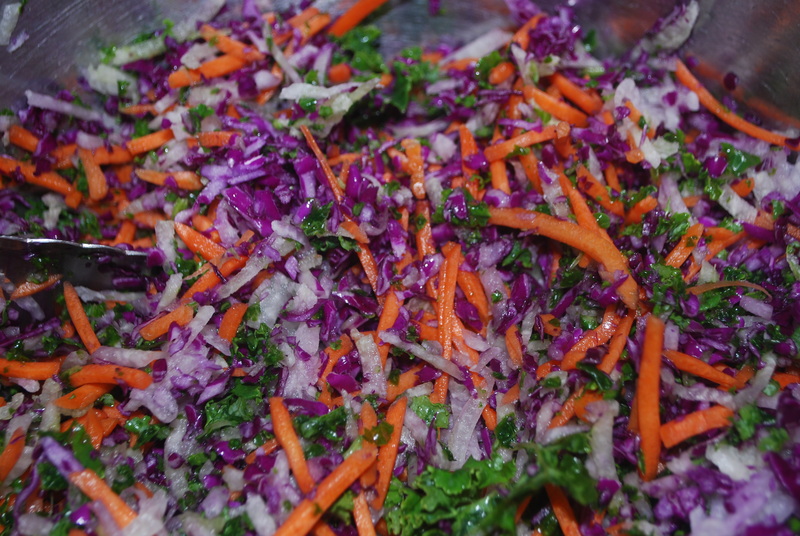 Place carrot, cabbage, jicama and kale in a large bowl. you can see how beautiful the colors are! 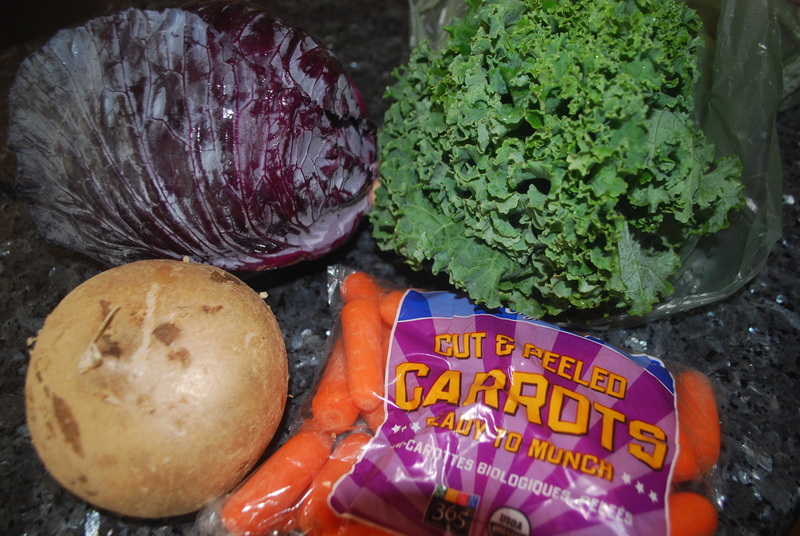 Combine the dressing ingredients in a blender or food processor and pour over the vegetables. Mix well. Note – you may prefer not to use all of the dressing. I like it a bit dry, but some people prefer it with more dressing. If you do not have a blender, or want to take a shortcut, omit the walnuts and just mix the remaining sauce ingredients by hand. While the walnuts add texture and a bit of creaminess and protein, the sauce will still taste great without them.